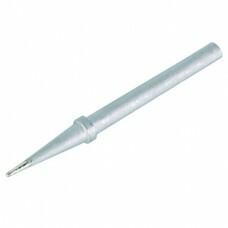 The BITS5 is a replacement tip for compatible Velleman soldering irons. Every soldering iron needs to have its tip replaced from time to time. This 0.5mm round conical tip fits the Velleman VTSS4 and VTSS5 type soldering irons and the Velleman model VTSS4NU 48W Adjustable Soldering Station.